The hop harvest season is upon us. This is one of my favorite times of the beer year, and it's the reason I started It's Pub Night in 2007. The last couple of years, Deschutes' fresh-hopped batches of Mirror Pond have been so good that I can't shake the feeling that it is the best beer anyone in history has ever been privileged to taste. This year they're actually going to bottle it, so people outside our little lupulin bubble are going to get to try it for themselves. It doesn't stop with Fresh-Hopped Mirror Pond: there are plenty of excellent fresh-hopped beers made in the Northwest and elsewhere. Enjoy them while they're fresh! 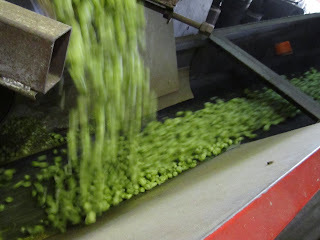 I got a hint from Widmer that they might do a true fresh-hop beer this year; let's hope Hopworks will also get it right. Sierra Nevada does make some of their Estate Harvest ale with fresh hops, but most of the Harvest Ale is done with hops that have been dried. SN pushed it even further last year, labeling Celebration Ale as "A Fresh Hop Beer". They make a sophistic distinction between "dried hops", "fresh hops", and -- this is clever -- "wet hops". As I said last year, do you go into the grocery store and ask for "wet parsley", or do you ask for "fresh parsley"? Wouldn't you be surprised if you asked for "fresh fish", and you were handed a dried cod? "I'm sorry, I didn't know you wanted wet fish. This one was freshly dried as soon as it was caught." Talk to your local brewers, and insist on honest fresh hops. 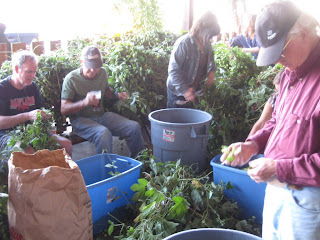 This coming Tuesday, August 30, 2011, you are invited to participate in one of the sweetest and most rewarding events you can attend in Portland: the Lucky Lab Hop Harvest. It's basically a shucking bee held on the patio of the Hawthorne Lucky Lab. People donate their homegrown hops for inclusion in the Lab's fresh hop beer -- aptly named "The Mutt" since its hop parentage is completely unknown and very mixed up. This year's Hop Harvest starts at 5:30 PM, a little later than in previous years, so you don't have to play hooky to join in the fun. If you have hops in your yard that you don't plan to brew with, bring the vines in, preferably within a few hours of cutting them down. The Oregon Brewers Guild teams up with Oregon Bounty each year to put on a few Fresh Hop Festivals around the state. The first one is always the Hood River Hops Fest, and the selection in Hood River always seems to be broader than that at the following fests. It's happening October 1, 2011, noon to 9 PM, between 5th and 7th Streets and Cascade and Columbia Streets in downtown Hood River. Minors are allowed until 6 PM. For being such a fresh-hop fiend, it pains me to say I haven't been to the Hood River fest before, but I plan to go this year. Love it. And I also agree with your assessment of Fresh Hop Mirror Pond. I finally had tried it at least years Fresh Hop summit at Roscoe's and absolutely loved it. The mutt sounds like a fun idea..
Any idea what the hop varieties are? I assume that they are separated or or are they all tossed in at the same time? @Sean: The Mutt is truly a mutt -- whatever hops show up are plucked and thrown together, and then that goes into the beer. Some of them are identifiable, some of them no one even knows what kind they are. I wish you would rant about fake organic beer with inorganic hops in them! That's an interesting point, and I have never really written about that (it has popped up obliquely in a post or two). My feeling is that someday there will be lots of organically grown hops available. Today there is a very small supply, so it's not unreasonable to cut some slack to brewers who use organic grain, but traditional hops. After all, it is those "organic" brewers who created a market for organically grown hops, so why punish them for a good deed? Still, maybe we should call for better labeling -- a footnote that explains what portion of the ingredients was not organically grown, and why. I don't think it would cast a shadow on organic beer, I think it would educate everyone about the issue and move the ball forward.